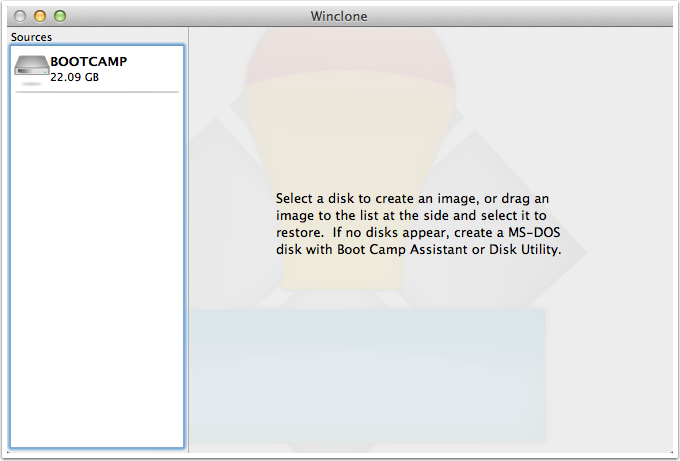 Using Winclone to create and restore an image of the Boot Camp partition is a relatively simple operation when using the same Mac hardware. But what about moving Boot Camp to different Mac hardware? And what about upgrading the hard drive on the same Mac? That can also be done in a relatively simple process, but there are crucial preparatory steps that must be taken to ensure that Windows will boot properly. Windows requires device drivers that are appropriate to the host machine, particularly display drivers, or it will crash (blue screen of death) the first time it starts up on on new hardware. 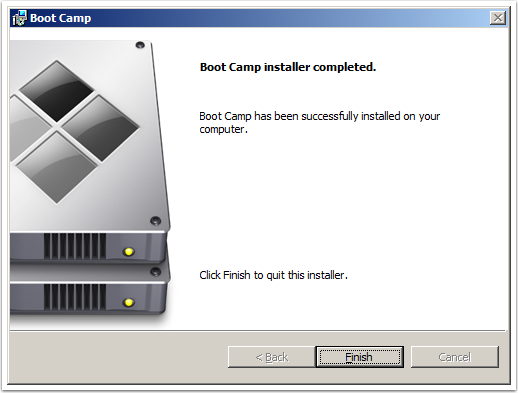 This tutorial explains how to migrate the Boot Camp partition to different hardware without crashing or necessitating a full reinstall of Windows. Sysprep - The migration process uses a utility built into the Windows operating system called Sysprep. Sysprep removes device drivers (called "generalizing") in order to reuse a Windows operating system on other computers. It also removes license keys for Microsoft Windows and Microsoft Office, so the valid license keys will be required when setting up Windows after the migration. USB flash drive - Windows device drivers will be downloaded fom Apple and stored on an external drive (which can also be burned to CD/DVD) and stored on a DOS FAT32-formatted external drive with at least 1GB of available space. Note: Although Winclone supports imaging of Windows XP in NTFS format, Apple stopped providing Boot Camp drivers for Windows XP in the latest versions of OS X, so the recommendation is to use Windows 7 or above as the source operating system for the Boot Camp migration. Another Note: Use of third-party drivers that allow OS X to read to and write from Windows NTFS should be disabled and/or removed before starting this process. 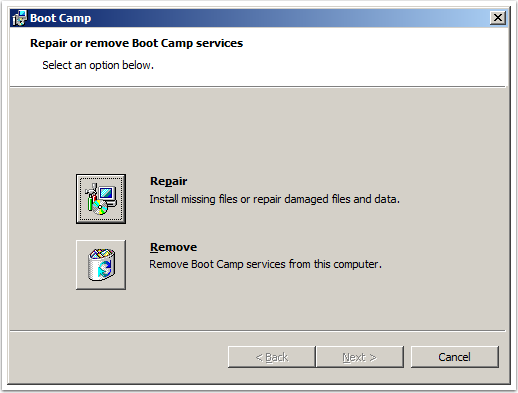 Running sysprep on your Boot Camp Windows installation will make changes to the Windows operating system. Before you begin, make sure to have a good file based backup of all data on all partitions prior to starting these steps. You may also want to create a "pre-Sysprep" Winclone image before starting this process. Sysprep will not render your original Windows operating system unusable, but it will require re-installing Boot Camp drivers and valid Windows license key afterwards, as mentioned above. 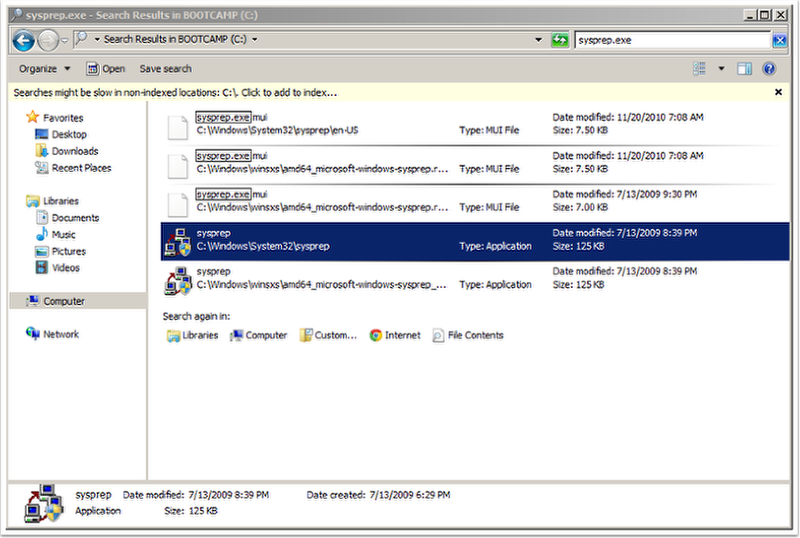 Open Windows Explorer on Computer (C:) and enter "sysprep.exe" into the search field at the top right to locate the Sysprep application. You may also navigate to C:\WIndows\System32\sysprep. Double-click on Sysprep to start the program. The example below is from a Windows 7 system and should look similar on Windows 8. The options for running sysprep are very simple. Select the "Enter System Out-of-Box Experience (OOBE) and make sure to check the Generalize checkbox. Generalize is what removes the device drivers from Windows, so it's very important to ensure that this box is checked before continuing. 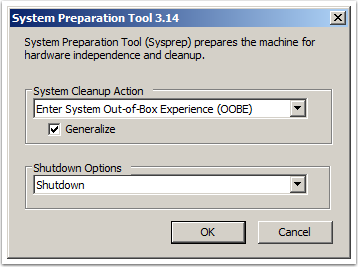 In the Shutdown options, do not select Reboot as you will not want Windows to restart again once sysprep is complete. Sysprep will begin removing driver registrations and generalizing the operating system. The display may flicker occasionally. Once sysprep is complete, Windows will shut down. Do not restart into Windows again before the image is created. First reboot into OS X. Occasionally, Sysprep will not run to completion and abort with the following message "A fatal error occurred while trying to Sysprep the machine". This error is due to a running process which must be shut down before Sysprep can remove the file during the generalize process. This process is the WIndows Media Player Network Sharing Service. You may need to elevate to Administrator privileges to take this action. To turn off Windows Media Player Network Sharing Service, click the Start button an in the Run box, type services.msc, which opens the Services MMC Console. In the list of Services search for Windows Media Player Network Sharing Service, right-click and click on Stop. Alternately, you may use the Command prompt (elevated to Administrator) and type: net stop wmpnetworksvc. 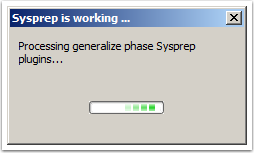 Then run Sysprep again and it should complete the generalize process successfully. Launch Winclone, and your current Windows partition should appear in the Sources list. If you are going to be restoring Windows on a partition that is smaller than the current partition, make sure to shrink the filesystem first. If not, skip to step 10. To shrink the NTFS filesystem, control-click on the bootcamp volume and select Shrink Windows (NTFS) Filesystem. Please note that shrinking the file system will not affect the file size of the resulting Winclone image or modify the data. Shrinking Windows will only remove allocated space from the Windows file system, allowing the Winclone image to be restored to the same size or smaller destination partitions. Verify that you want to shrink the file system. The file system will be reduced to the smallest size possible. 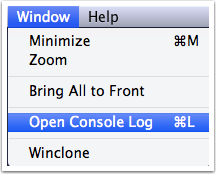 If you want to see the resizing progress, select Windows->Open Console Log. After the Boot Camp partition has been resized, you will see the new file system size. Note that this is the smallest partition size available and you'll need a Boot Camp partition that is the same size or larger to restore the filesystem. You are now ready to create an image of the Boot Camp partition. 1. 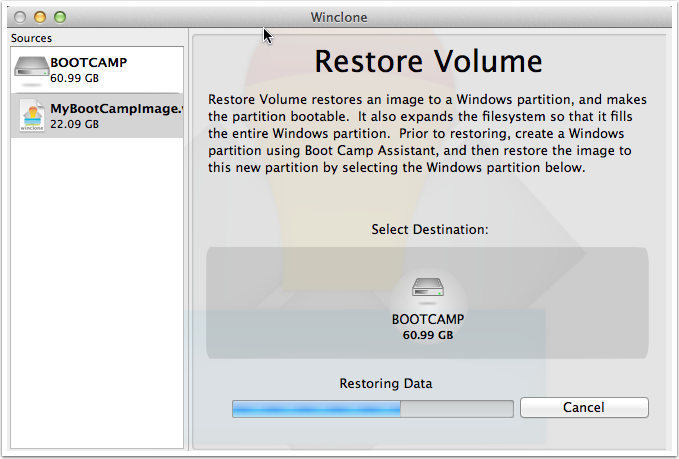 Select the Bootcamp partition. Windows keeps a large file called a pagefile.sys on the Bootcamp partition. This file takes up a lot of space and is recreated on startup, so it is generally recommended to select "Remove Memory Cache Files" when creating the image. However, in special cases, for example when a drive is already failing or has corruption on it, deleting files may cause issues. Select to Keep Cache Files or Remove Memory Cache Files. Select a location to save the Winclone image. The image can be saved to the desktop, the Documents folder or a secondary Mac-formatted storage drive. 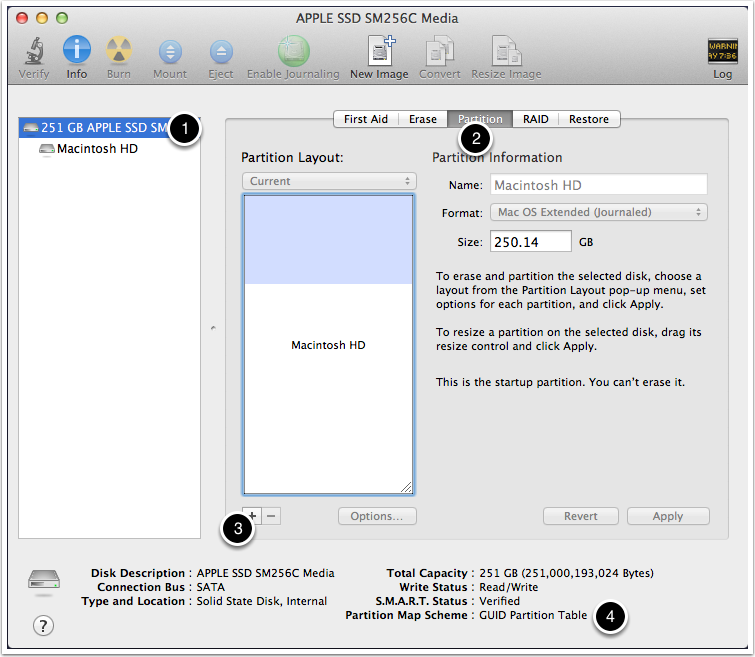 As this image will be used to restore on a different Mac, the image needs to be moved or copied to a drive that will be accessible to the destination Mac system. The Winclone image will now be created. Depending on the size of your bootcamp partition, this may take some time. You may choose to select from the Winclone file menu Window-> Open Console Log to follow the progress of image creation. Once the imaging process completes, you'll see a confirmation. This concludes the image creation portion of the tutorial. The remaining steps are conducted on the destination Mac to which the image will be restored. 4. Note: Make sure that the partition map scheme is a GUID Partition Table. If it is not, then you'll need to repartition the entire drive and select GPT under Options in order to use Winclone to restore an image. 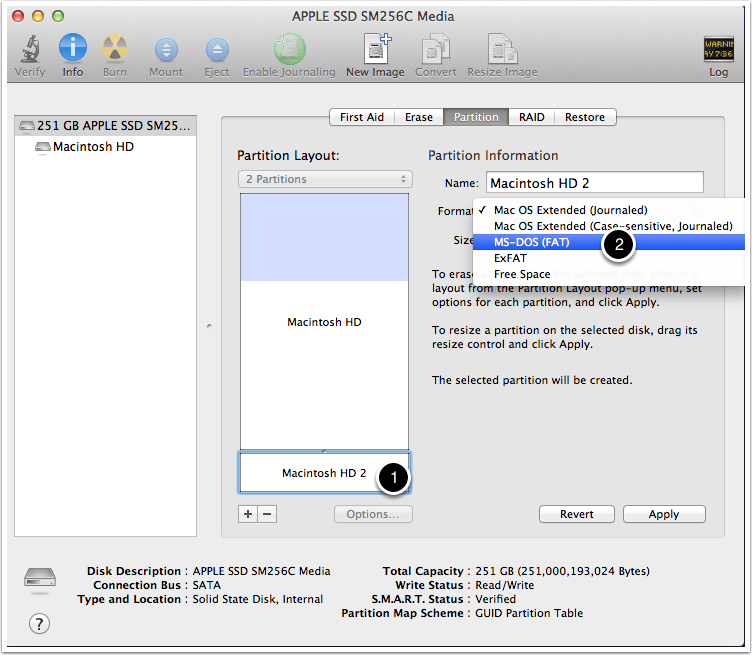 This is the standard partition scheme for Mac-created partition maps. Format the new Boot Camp partition as MS-DOS (FAT). 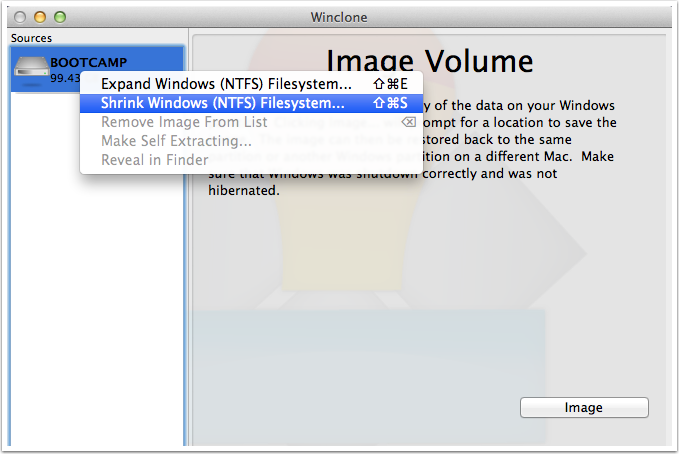 The file system will be changed to NTFS during the Winclone image restoration process. 1. 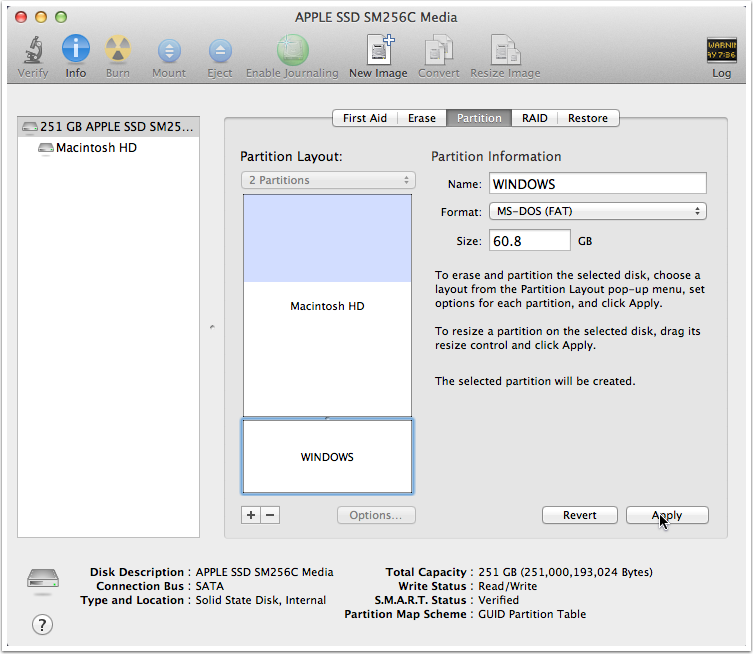 Select the new partition. You can now drag the divider between the partitions to set the size you would like of the Windows partition and the Mac partition. Remember that the new Windows partition must be at least the size of the imaged file system as described in Step 9 above. 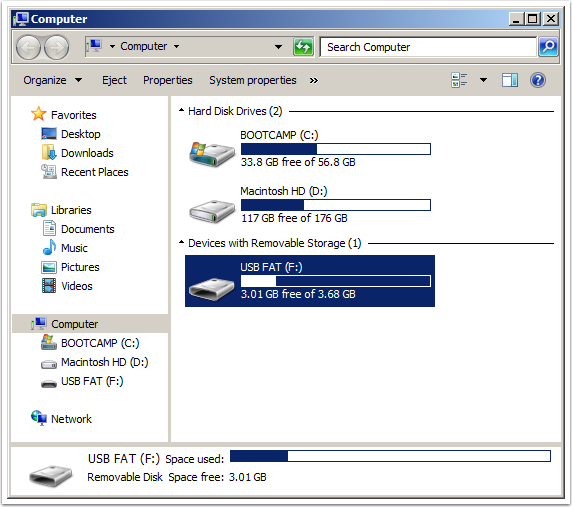 It is also a good practice to make the new partition larger than the file system since there can be slight differences between how the size is calculated. If you chose the Shrink Windows Filesystem option before imaging (step 5 above), be sure to create a partition at least large enough to contain the file system, temporary cache files and your own file data. 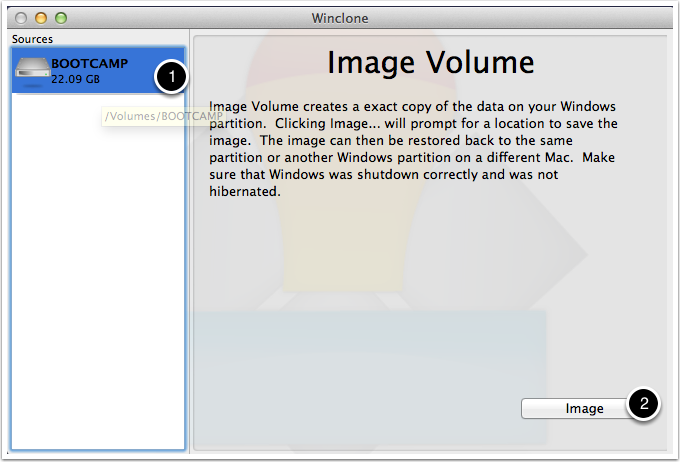 Give the new partition a name to easily recognize it in Winclone. 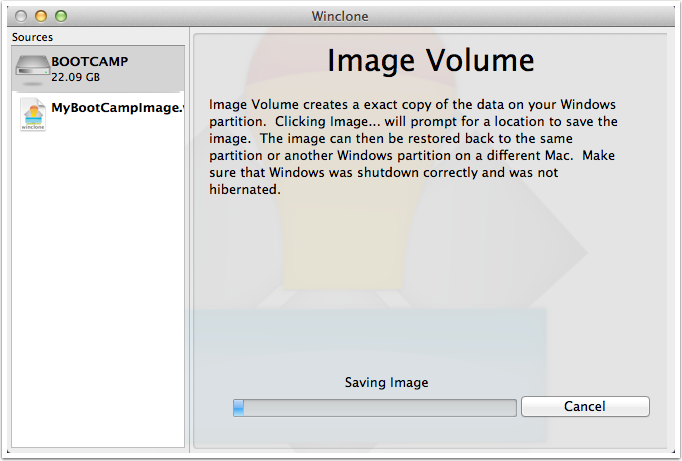 Click Apply to resize the Mac partition and create a new Windows partition. 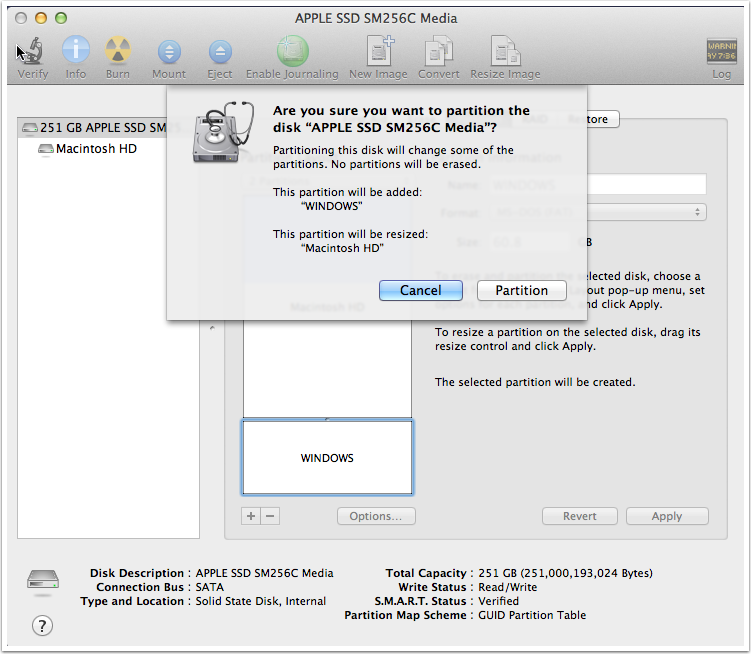 Disk Utility will verify that operations that it is performing. Make sure that the Boot Camp partition is being added and the Mac partition is being resized. If this is correct, click Partition. You will be asked if you want to restore. 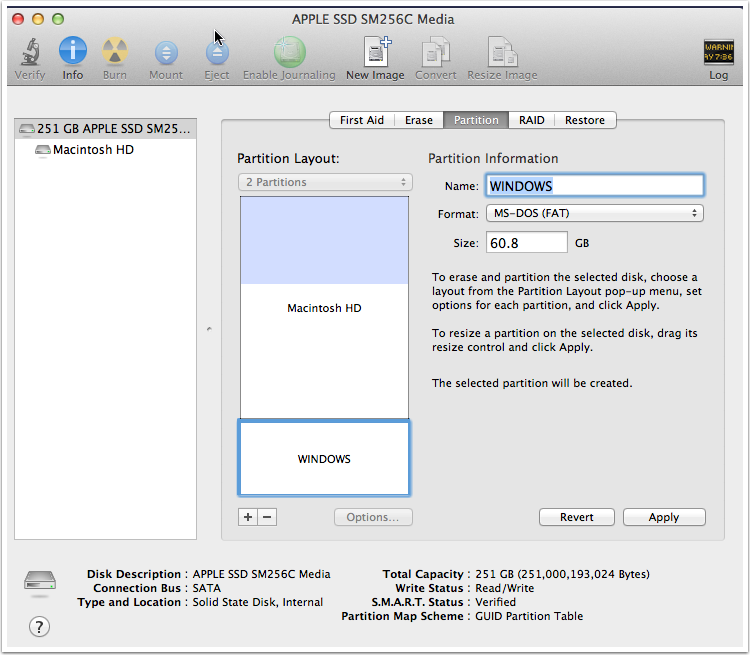 Verify that the correct partition is being restored to, and click Restore. In Windows Vista and Windows 7, Windows uses a boot file called BCD to determine which partition is used to boot. Unless you specifically created a custom BCD configuration, select "Replace BCD". The restoration will start. It may take a while depending on the size of the image. You can see detailed information on the progress by selecting Window->Show Console Log. Once restoration is complete, click OK. Because the restored image has had Sysprep run, the drivers will not be installed yet. The next step will be to download Windows device drivers with Boot Camp Assistant. 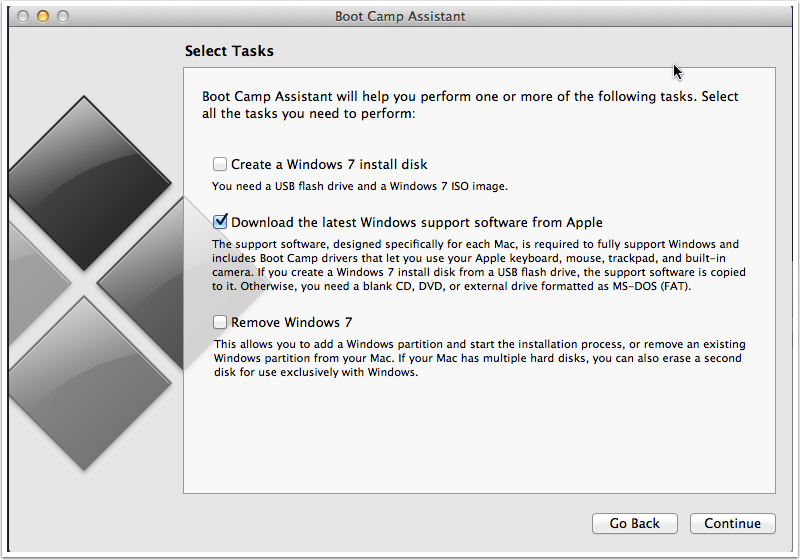 Go to Applications -> Utilities -> Boot Camp Assistant and select "Download the latest Windows sypport software from Apple" and click Continue. You will need a USB drive formatted as FAT32 with at least 1GB of space available for downloading the Boot Camp drivers. 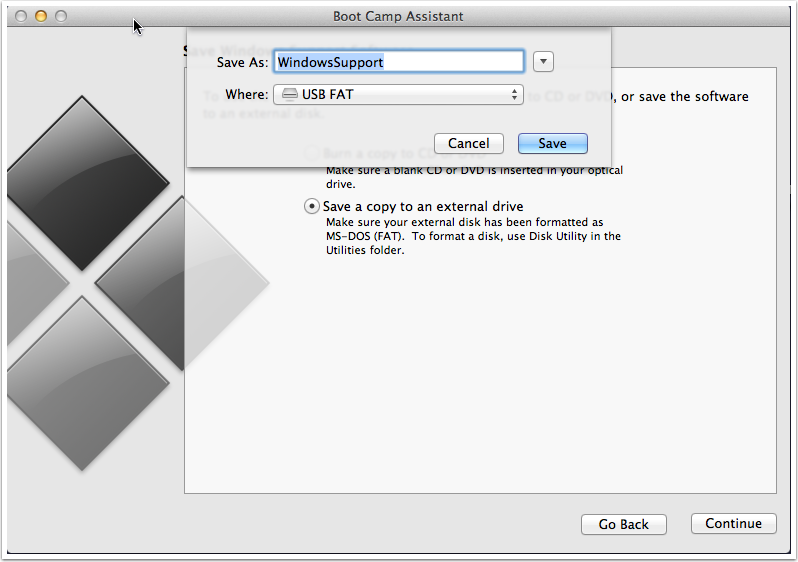 Attach a DOS (FAT32) formatted USB stick or external drive to your Mac and select "Save a copy to an external drive". Click Continue. Select the DOS (FAT) drive and save. Click Continue. 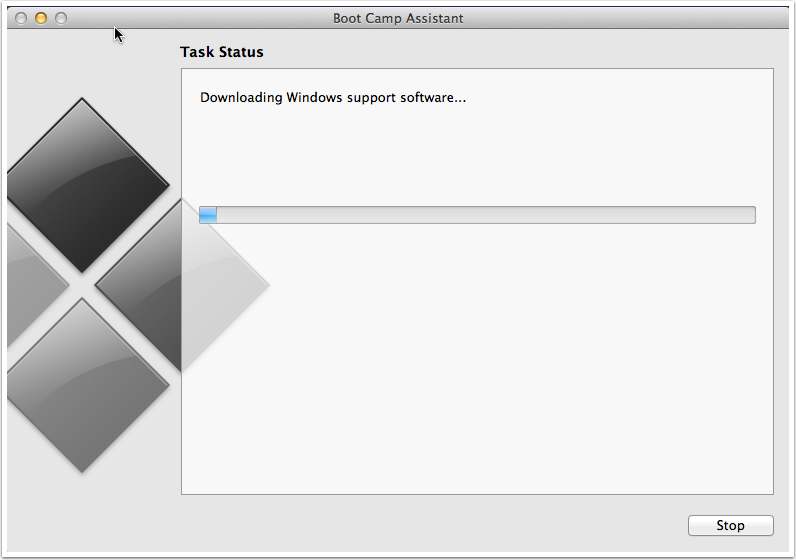 Boot Camp Assistant will now begin downloading the drivers to the external drive. This may take some time to complete. 1. 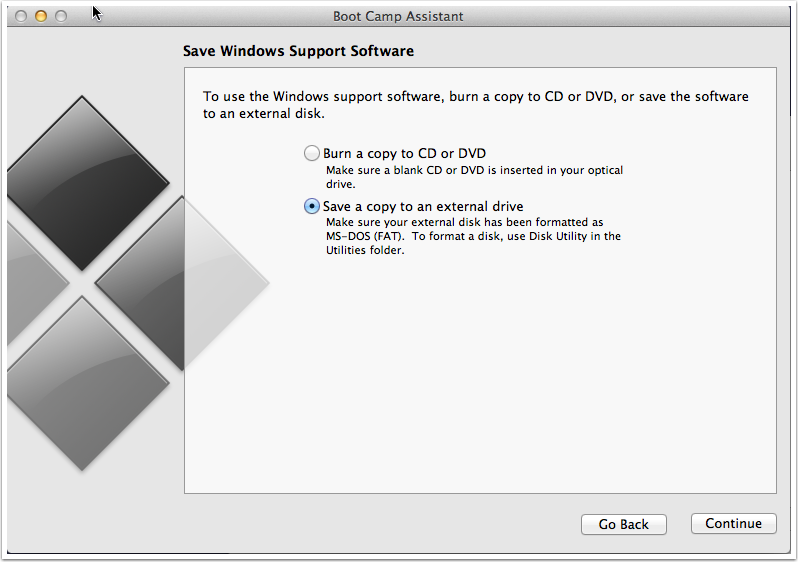 Go to Apple Menu -> System Preferences, select Startup Disk and select the Boot Camp Windows partition. Click Restart. 2. Restart the Mac. Hold the Option key while restarting. 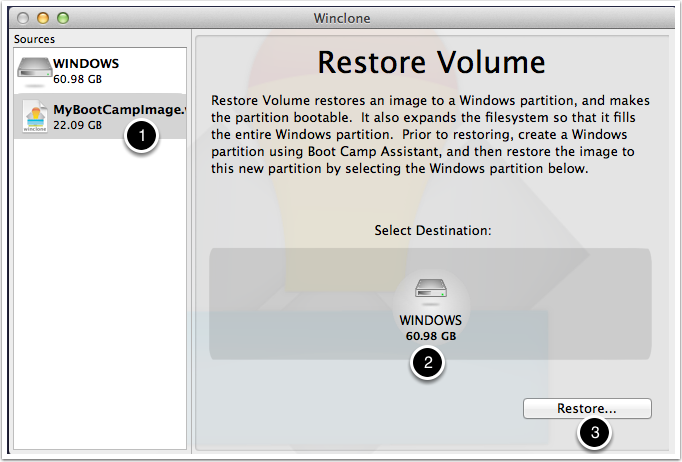 Select the Boot Camp Windows partition. Now boot into Windows. You will notice that the system will initiate the CHKDSK process before booting. This is expected behavior. Once CHKDSK completes, Windows will restart. It may take longer than usual as Windows is in "discovery mode" and selects drivers for all detected devices. Do not be suprised if the screen display flickers once and then appears at a low resolution. 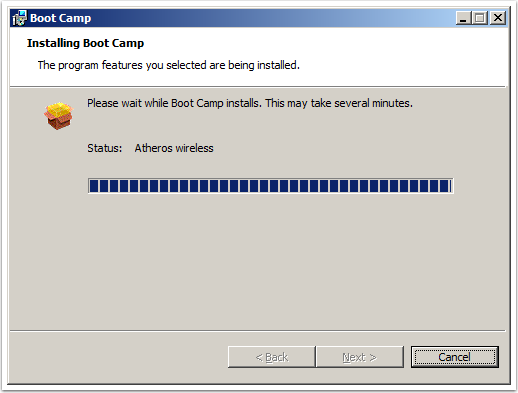 All driver-related anomalies will be resolved by installing Boot Camp drivers, which we will get to shortly. Due to the Sysprep process run previously, Windows will now present a prompt to create a new account. Simply create a new account which will be removed later. Windows will display the new account as well as your existing user account. Once logged in to your existing account, you may remove the temporary user account. 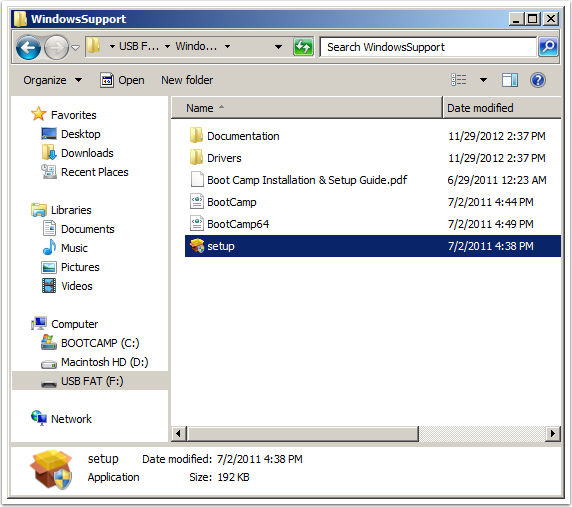 Once logged in to Windows, select the USB drive and locate the folder containing the Boot Camp drivers. Click setup (or setup.exe) to begin installing the device drivers. Select the Repair option to install the drivers. During the driver installation, the display may flicker occasionally. Once the drivers are installed, click Finish and reboot into Windows again. You may need to configure wireless input devices, display resolution and other settings. You may also need to re-enter license keys for the Windows operating system and for Microsoft Office if it is installed. At first glance, the process of moving Windows from one machine to another may appear to be a daunting task. However, using the process outlined above will save many hours otherwise spent installing the Windows operating system and programs, personalization settings and files from scratch. 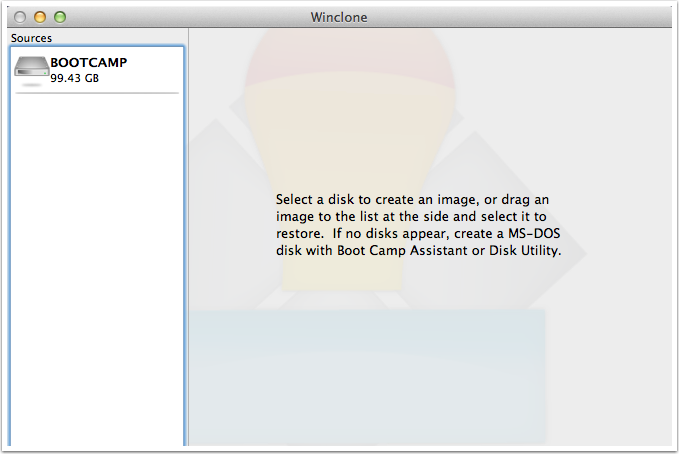 Using Winclone with Sysprep is a powerful way to preserve your Boot Camp Windows environment when changing Mac hardware. Article published: April 21, 2017 03:00 . Article last updated: April 21, 2017 03:00 .